Dave Finley's book, Morse Code: Breaking the Barrier, MFJ's all-time best-seller, has gone into a second printing. With the 13- and 20-wpm amateur tests gone, much of the "bitter medicine" aspect of Morse Code has disappeared and hams are learning the code purely for the fun of CW operating. Whether you want to work the world with a homebuilt QRP rig, grab rare DX during CW contests, or try your hand at Moonbounce, Morse Code can add to your radio pleasure. Find out how you can quickly gain Morse proficiency and join the fun. So You Want to Learn Morse Code, Dave's classic Internet article on the Koch Method of Morse training, is here. This article, which has been reproduced widely throughout the world, has introduced thousands of hams to the best Morse training method ever devised. 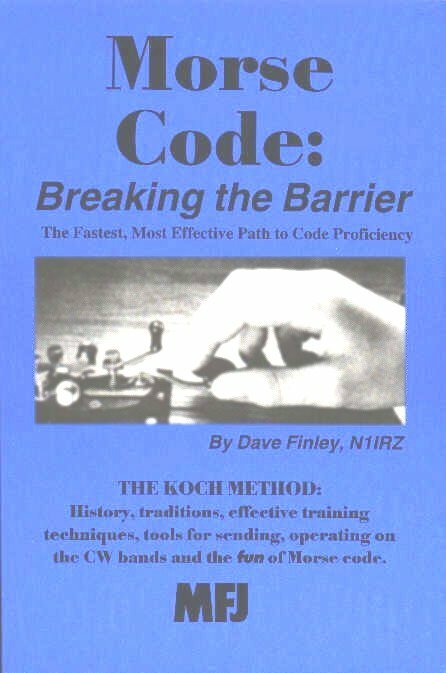 While full details of Koch training are found in Dave's book, this popular article will show you how the Koch Method can succeed in producing Morse proficiency when other methods fail. The Radio Century: The 20th Century really should be called The Radio Century, because radio played a key part in producing the tremendous technological advances of the century, in addition to tranforming society itself. This article appeared in The Albuquerque Journal in November, 1999. The Russian Woodpecker (remember that?) How hams fought their own Cold War battle with the Soviets. Radio Astronomy: The Ham Radio Connection -- The science of radio astronomy, which revolutionized our understanding of the Universe, produced six Nobel Prize winners, and today is one of the most valuable tools for the continued study of the Universe, is a direct descendant of amateur radio. This article explains the connection. When Warner Brothers filmed Contact at the Very Large Array (VLA) radio telescope in 1996, Dave Finley served as liaison between the film crew and the Observatory. His account of the filming at the VLA, Hollywood Comes to Socorro, now is online. The National Radio Astronomy Observatory has published Radio Interferometry: The Saga and the Science, edited by Dave Finley and Miller Goss. This book contains the proceedings of a symposium honoring NRAO's Dr. Barry Clark on his 60th birthday. It includes recollections of those who conceived and built the Very Large Array (VLA), the Very Long Baseline Array (VLBA) and other high-resolution imaging radio telescopes, and reviews of the scientific discoveries made with those telescopes. For the latest news on the exciting discoveries made with the powerful telescopes of the National Radio Astronomy Observatory, look at the observatory's press releases, many of which Dave writes. Six Meters: An Introduction Six Meters really does deserve the name of "The Magic Band." This band will excite you with a wide variety of propagation modes and the constant promise of surprises. If you have a no-code license, Six Meters is an excellent way get some experience in working other hams hundreds or even thousands of miles away. Here's an introduction to the band. Three Watts and a Hunk of Wire: Check out Dave's review of MFJ's QRP Cub CW transceiver kit. How about working the world with an 8-ounce radio that fits in the palm of your hand? Ham Radio Obsolete? An answer to those who say the Internet and cell phones make amateur radio obsolete.